Washing your car is a must if you want to keep it in good shape, but paying for car washes can get expensive. If you want to save some cash but still maintain your car clean and shiny, why not do it yourself? If you have the space and the right tools to wash your car at home, you can get the job done just as great as the pros. Use these car washing tips from Synthetic Oil Direct to keep your car looking its best. Before you head outside with a bucket of water and some dish soap, take a step back and put down the dish soap. In order to wash your car properly you'll need the proper supplies. Since dish soap, hand soap, and any other soap you may have in your home aren't made for washing cars, the can actually cause damage to your car's paint job. To prevent damaging the paint and stripping off your car's protective wax layer, make sure you're using a car washing solution that is safe for your vehicle. These solutions tend to be milder so they won't harm your car. Also, don't use just any sponge since this leaves your care at risk for hairline scratches. Instead, look for a lamb's wool mitt that will be soft enough for scrubbing your car without causing any scratches. Tougher areas like your tires and wheels will require specialty cleaners and tools because they tend to be exposed to harsher substances. If your car has been sitting in the hot sun or if you just got home from a long drive, chances are your car's exterior is quite warm. If this is the case, move your car into the shade and let it cool down before applying any car washing fluid on it. The reason this is so important is because the warmer your car's exterior is the faster the suds will dry onto your car's paint. This makes it much harder to get your car clean. If the soap dries onto your car's exterior before you have a chance to rinse it away, your car may end up with water spots and deposits that won't make it look clean at all. Contrary to popular belief, rinsing your car isn't one of the last steps in washing a car. In fact, this should be your first step. If your car is looking dirty, it's obvious that it has a layer of dirt and debris sitting on its exterior. If you don't rinse off this layer of debris before starting to scrub your car down with a car washing solution, you risk scrubbing this dirt and debris into your paint job. This can lead to scratches that were totally preventable. Even if your car isn't visibly dirty, it still needs to be rinsed off before you start scrubbing away. After washing your car, don't forget to also take care of it insides. Give your car a synthetic oil change in Warminster to keep it in great shape for longer. If you're looking for a great synthetic oil that will keep your engine healthy, contact Synthetic Oil Direct for the personalized service you're after. Their oil pros can recommend products like AMSOIL's Signature Series 0W-40 Synthetic Motor Oil, a great synthetic oil that will keep your engine protected for longer than standard conventional oils. For more recommendations like this one, call them at (215) 834-8720 or stop by their online shop. Once your car has been rinsed and you're ready to get to washing it, don't try to wash your car all in one go. It's much easier to wash your car in sections in order to prevent the suds from drying on your car's exterior before you've had a chance to rinse them away. Pick a section of your car to start on and wash from top to bottom. 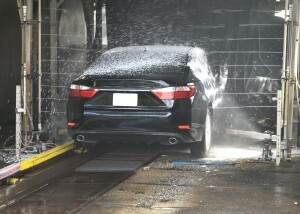 Once you're done washing your car and all of the suds have been rinsed off completely, it's time to dry your car. Avoid letting your car air dry since this will just produce water spots on the exterior. If you're tempted to drive your car around the block to help it dry off faster, this technique won't work either. You're better off manually drying your car so that your hard work doesn't go to waste. So, when it's time to dry your car, what can you use to dry it without leaving residue or scratches on the paint? Your best option is a drying chamois, or a few. Using a drying chamois will prevent hairline scratches and residue from dulling your car's shine. For the best results, avoid rubbing your car and don't use too much pressure to soak up the excess water. Is It Time for a Synthetic Oil Change in Warminster? Now that your car's exterior is looking great, get the insides to match with a synthetic oil change in Warminster. To find the best synthetic oil for your car, contact Synthetic Oil Direct at (215) 834-8720. Their oil experts will be happy to help you find all of the best AMSOIL Oil products to keep your car in great shape. Find all the products you need in their online shop.